Since the actual voice recordings were recently released, I wonder if a next step could be for Hunt to make a recorded audio collage of Space Administration, complete with a sampling of the sonic unintelligibility and charming equipment static in the NASA recordings, taking this literary project from printed form into an audio landscape—considering that NASA just released the audio—and thus conceptually speaking to one of the book’s aims as stated in the description below to perform “an elegiac call to Apollo, the god of poetry” by having his listeners receive that call. From Poetry will be made by all! 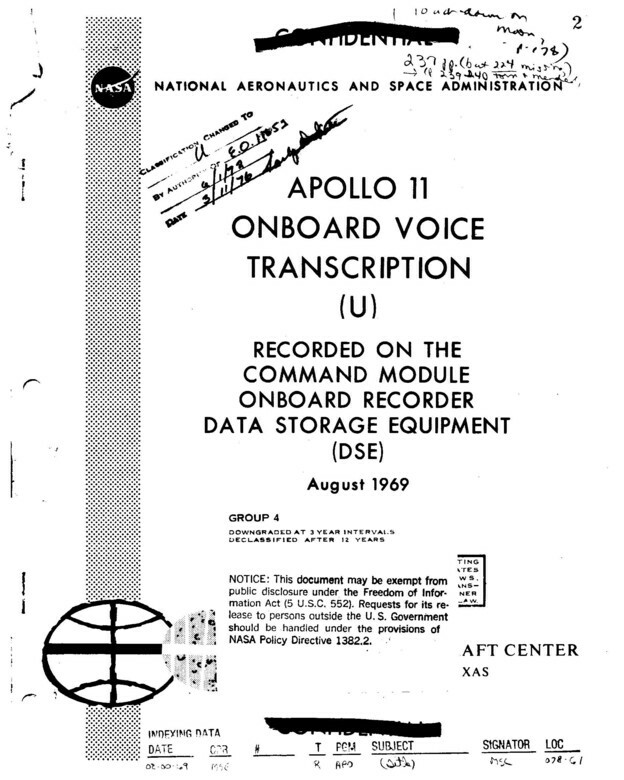 Space Administration plunders NASA’s voice transcription of the first day of the Apollo 11 moon mission, uncovering a book of conceptual poetry that reimagines the erasure process as “spacecraft” (which is to say, the “crafting of space”). The book envisions its writing process as a venture of space exploration. Readers encounter a void populated by columns of numerical time-codes and by constellations of words. These textual “star-charts” evoke the materiality of the page’s empty space. The text performs an elegiac call to Apollo, the god of poetry, integrating every occurrence of “Apollo” (along with all deific terms such as “fire” and “hell”). Temporal and authorial language signals the text’s self-reflexivity, while optical language and direct address call out to the reader. The text reimagines Apollo as an alien entity dwelling in the empty spaces of the text, and efforts to contact Apollo transform the page into an event horizon, enfolding both reader and author into a space where time might seem eternal. The author can spend an eternity creating different erasures of the same page, erasures that the reader might spend an eternity reading. The time-codes add a temporal dimension to the empty space of the page. By timing silence, they draw attention to the absent text, enhancing its “hauntedness.” The numerical columns are juxtaposed alongside the organic constellations of words, evoking the tension between numeric discourses and lexical discourses, all of which sustain life aboard machines needed to survive in space (where amounts of fuel and oxygen must be constantly monitored and announced). A triptych “drop-poem,” created from the word “CONFIDENTIAL” precedes the erasure, and a series of asemic visual poems follow the erasure. The asemic poems invent a form of calligraphy out of the strikethroughs used to cross out the word “confidential” on the opening page. This calligraphy exemplifies the creation of a new text through the re-censorship of the declassified transcript. The book’s rectangular cover page image (derived from the NASA logo), 1:2 page size ratio, and solid black flyleaf pages mimic the monolith from Arthur C. Clarke and Stanley Kubrick’s film Space Odyssey: 2001. The black flyleaf pages perform the re-censorship of the document, suggesting that, by reading the erasure, the reader accesses an alternate censorship of the original text.